Okay, show of hands… How many of you have spent $20+ on a miracle acne treatment? I know I have time and time again. From Proactive to Lush, each time I shell out the green I justify it to myself saying “This could really be the one that works!” That being said, in recent years I have fallen in love with organic skin care. I’ll promote natural skin care ‘til the cows come home (more of this to come later). However, a thought hit me when I began working for Bare Bones early this year. I’m spending all this time and money on all these fancy products, but I’m still missing something key in my skin care routine. Can I realistically fix my skin with my diet? Now I know what you’re thinking. “Yeah, Mom told me to eat green vegetables and drink lots of water so my pimples will disappear. Then the dreamy quarterback will fall in love with me and all my problems will disappear.” I think we’ve all heard the same thing at one time or another. That wasn’t my exact revelation, however, why not start with my stomach? Your stomach is the bouncer for the club that is your body. They decide what vitamins get in the club, the nutrients that get into the VIP section, and the gross byproducts that get tossed out on the street. Why shouldn’t my bouncer be a little stronger? So, I began my research in earnest and what I found went against everything I previously knew. Yes, you heard me right. If you’re in taking too much water it can dilute down your stomach acid, inhibiting digestion. Of course, I’m not putting water down. You should still consume the suggested amount every day. Nonetheless, it’s recommended that you limit your amount of fluids during mealtimes to eight ounces or less and steer clear of sodas and juices that can debilitate digestion. Instead of sitting down and chugging two glasses before lunch or dinner start out with a nourishing cup of bone broth to prime and seal your digestive system for your next meal. Among many other certain events in a woman’s life, one we dread the most is sagging skin. Decrease in collagen levels happen every day which means less elasticity and more crow’s feet. Collagen plays a huge part in skin health by repairing and replenishing skin cells which results in smoother, firmer skin. Topical creams can often irritate skin, but ingestible collagen has little to no side effects with measurable results like this study here. Beyond being good for replenishing facial cells, benefits have been shown for those plagued by stretch marks and cellulite as well. 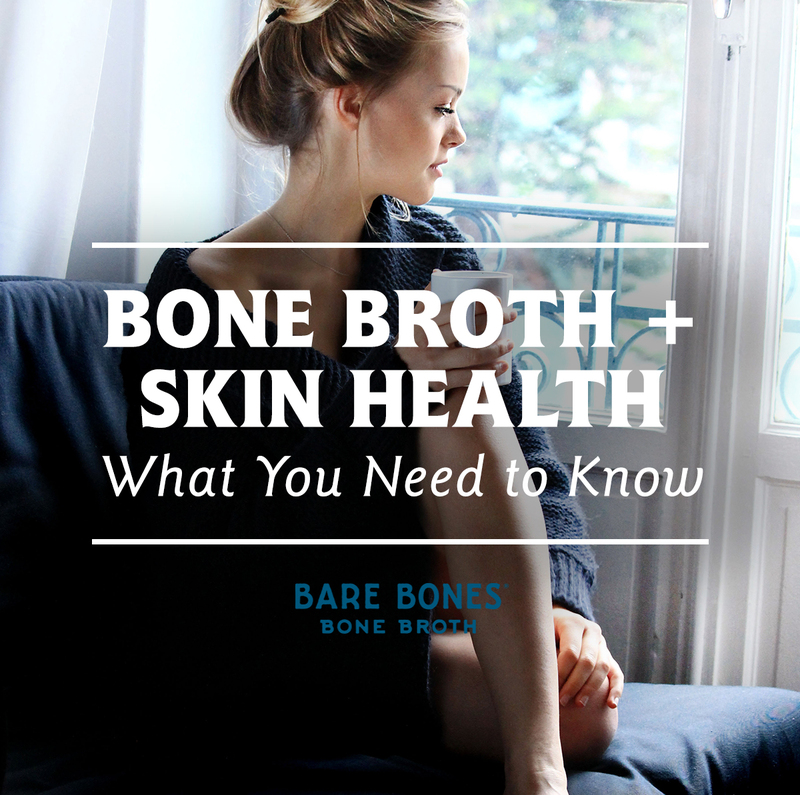 Bone broth is well known for its abundance of collagen, which makes it an ideal candidate for skin care fanatics across the board. Good food CAN fix all your problems. One of the hard-learned lessons of life is you are what you eat. My rip-roaring 23-year-old metabolism sometimes allows me lots of leeway in terms of digestion and weight gain, but I’ve began to feel what I eat in my joints and without a doubt my skin. It’s easy to forget post middle-school-pimple-queen phase that all those Diet Cokes and preservative-packed snacks are going right back to your skin. Our skin reads like the warning signals on your car dash for everything we ingest. Toxic chemicals and deadly fats slow your system and block good nutrients from being absorbed, which can end up becoming major health issues in the long run(cue 20 car pile-up). However, good foods work like a world class pit crew. Bone broth is WD-40 for your whole body; easing joints, coating the digestive system, and most importantly priming your skin. It preps you from head to toe to get to the checkered flag.